You may know it as The Dude’s cardigan or The Big Lebowski sweater, but we debuted the Westerley cardigan in 1974 as part of our Westernwear line. The Westerley drew inspiration from beautiful Cowichan sweaters that are hand-knit by Pacific Northwest tribes. Heavy enough to work as outerwear with only two knit stitches per inch, our version was machine-knit by Winona Knitting Mills of Minnesota, a two-facility company owned by the Woodworth family. Super thick and warm, the Westerley was one cozy sweater. We carried it for more than ten years. Throughout those years, the Westerley’s zip front, ring zipper pull, shawl collar and Greek key pattern all stayed the same, although the color variations were surprisingly wide. The sweater went out of production in the 1980s, but found popularity again in the early 2000s, thanks to an obscure movie that didn’t stay obscure for very long. This Coen brothers’ film was released in 1998, but quietly grew into a cult favorite. No one can pinpoint the exact reason why. Was it Donny’s clueless questions? Walter’s chin-strap beard? The German nihilists? The dream sequence scored by Kenny Rogers and the First Edition? Well, it was probably a grand confluence of all of these important factors, plus the masterful turn taken by Jeff Bridges as The Dude. He staggers in and out of trouble, alternately wearing sweats, shorts, pajama pants, a bathrobe, and a battered Westerley cardigan. Jeff Bridges wore his own clothes for this role, and though there were two sweaters handknitted as backups, he preferred wearing his personal Pendleton® Westerley. The Big Lebowski continues to grow as a cultural phenomenon. It’s not a movie anymore, it’s a lifestyle. Its fans, the Achievers, have conventions and their own documentary. And as the movie’s audience has grown, so has the demand for a recreation of the Westerley sweater. 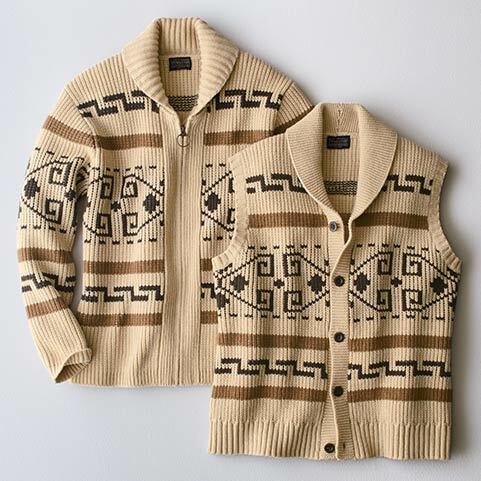 Pendleton’s first run at reproducing the The Dude’s cardigan came in 2011. Not an exact replica, it had the weight and coloration of the original Westerley, with a slightly different knit pattern and a leather zipper pull. This revival Westerley generated an enormous amount of publicity, especially since the sweater worn by Jeff Bridges in the movie was going to auction. The provenance of the auction sweater came into question and it was withdrawn. Pendleton’s version sold out almost immediately. In fall 2013, we brought back the original sweater under the Westerley name. We went to the archives and settled on two versions: cream with red and black, and brown with navy and gold. These sold well to the fashion crowd, but didn’t satisfy The Big Lebowski fans. In 2014 we added another archival coloration in charcoal and blue. And while these were all great Westerleys and sold well, they were not the sweater the Achievers wanted, and the Achievers would not be denied. Well, it’s here. We scoured the archives and studied the movie, bringing the Westerley back to its original color and weight—even the ring zipper pull has been restored. The Original Westerley abides in all the right ways.